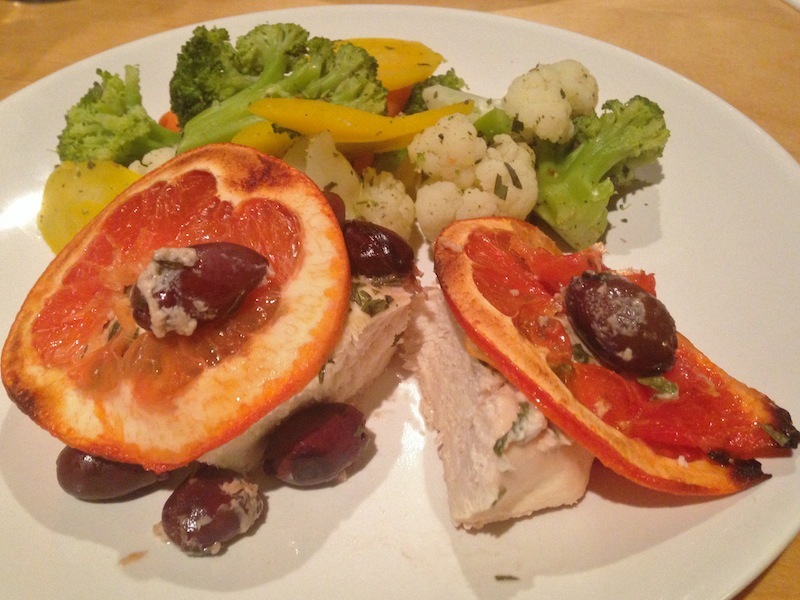 Chicken with Tarragon, Grapefruit, and Olives | Keep It Up, David! I wanted to continue my little streak of cooking and eating citrus fruit, peel and all, so I came up with an easy, simple chicken recipe and tried it out on a couple friends who came to dinner. My recipe is inspired by a delicious meal my friend Katherine made in Sweden, which in turn was inspired by a Martha Stewart recipe. Leave it to me to mess around with Martha’s perfection! It starts with four chicken breasts. They fit perfectly in my loaf pan, so I slicked it with cooking spray and lined them up. 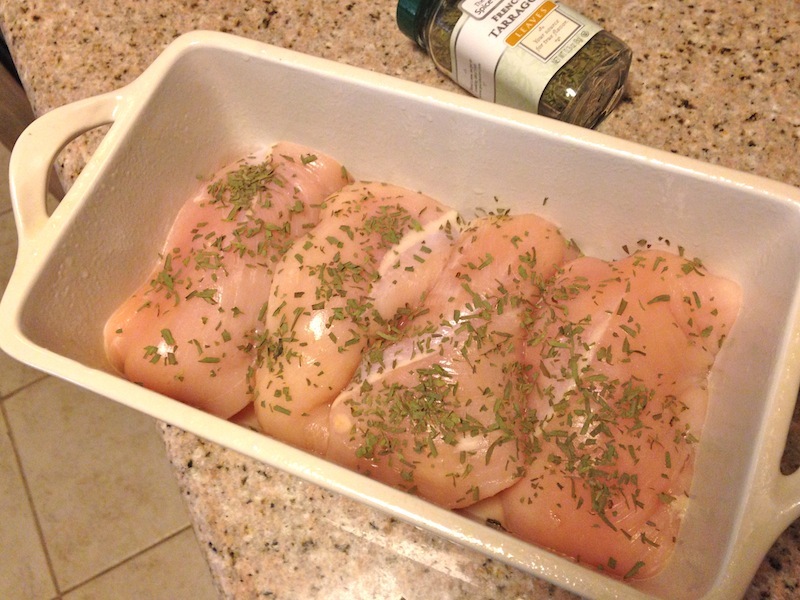 I sprinkled dried tarragon all over the breasts. Tarragon and grapefruit are a classic combination. Did you know that? That’s according to the Jan./Feb. 2015 issue of Women’s Health magazine, which I picked up months ago when I went to take Britney Spears’ favorite workout class. RELATED CONTENT: Lots of recipes on my Recipes page! 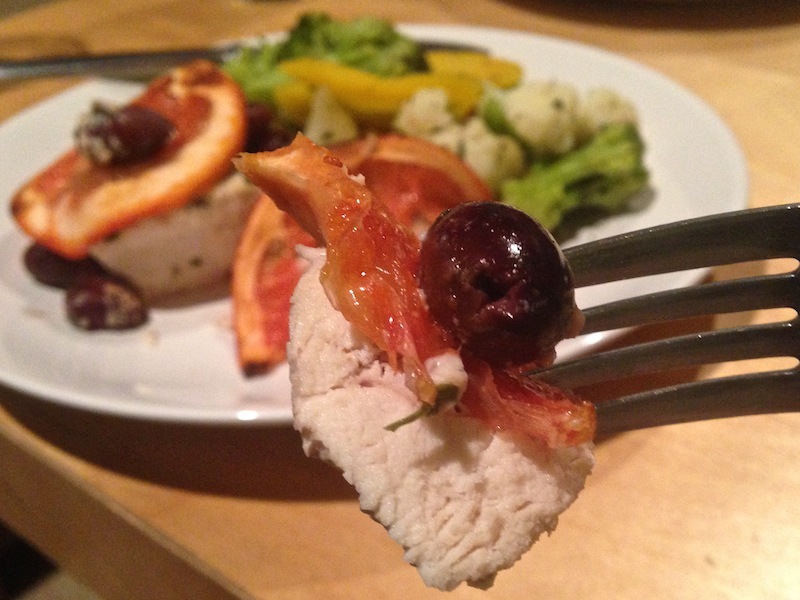 I tossed some drained, pitted kalamata olives on top of the chicken (about half of a 7-ounce jar). Olives add flavor and salt, and they actually go well with lots of different fruit when you cook them together (maybe because an olive is a fruit, too?). 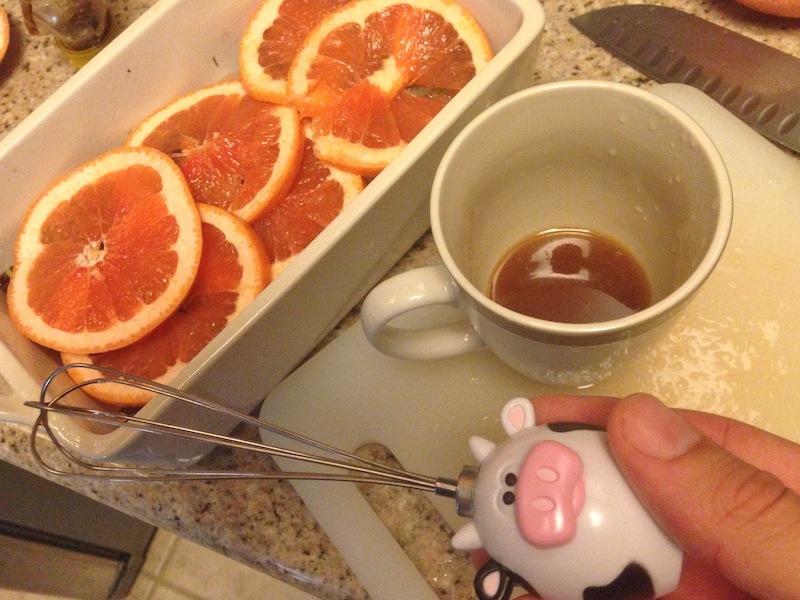 Then I sliced a grapefruit as thinly as I could. I wanted six slices. Be careful with the grapefruit juice. It’s strong! A little goes a long way. I poured the glaze on top before popping it in the oven, but I wish I had waited. It added a lot of liquid, which my chicken ended up poaching in, instead of getting roasted. Anyhoo – the chicken goes into a 400-degree oven for 40-45 minutes, or until it’s cooked through. If you want to use the extra liquid as a glaze, add it with 10 minutes remaining. Or do what I did, and the chicken will simmer in the liquid in the oven. My way my mighty delicious, and I’m sure the other way would be too. Wanna see the final result? I steamed some mixed veggies as a side dish, sprinkling them with tarragon and some Mrs. Dash. And yes, you can eat the grapefruit, peel and all! 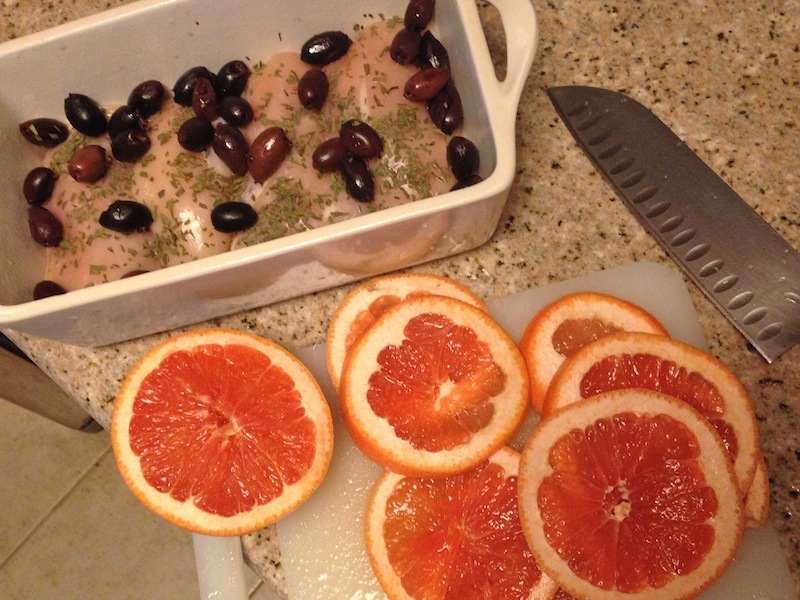 Between the olives and grapefruit, this dish has big, bold flavors. It’s tangy and briny and a little sweet (thanks to the honey), and, best of all, it’s really good for you. And did you notice how easy? Only five ingredients! Bonus perk: this translated very well for leftovers. This dinner was delicious (and my friends agreed), and so was my lunch. This entry was posted on Tuesday, June 23rd, 2015 at 12:01 am and is filed under Uncategorized. You can follow any responses to this entry through the RSS 2.0 feed. You can leave a response, or trackback from your own site. Looks good! 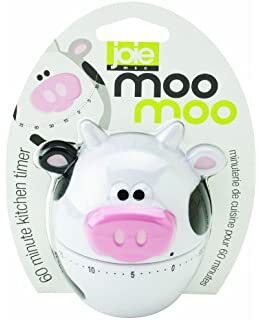 Is that a pig or a cow? Yep, cow whisk. I said ‘piggy’ to see if anyone was actually reading. You win! That’s what I meant – cow whisk! I know you were joking, so was I. I don’t actually read it – I have it dictated.